Though many of the miles I travel are spent in the air, I never miss the opportunity to take a wonderful walk. There’s no finer way to get to know a city than by walking its streets. In some cities, like Vancouver, British Columbia, mother nature provides spectacular scenery creating one of my favorite walks of all time. I call it the Seawall Loop. It’s the best walking tour in Vancouver! Come join me as I take you every step of the way showing you the routes to take and glimpses of the fantastic sites you’ll see. This is the long Seawall Loop walk. It can be cut short by taking shortcuts through Stanley Park. Let’s Get Started With The Best Walking Tour in Vancouver! 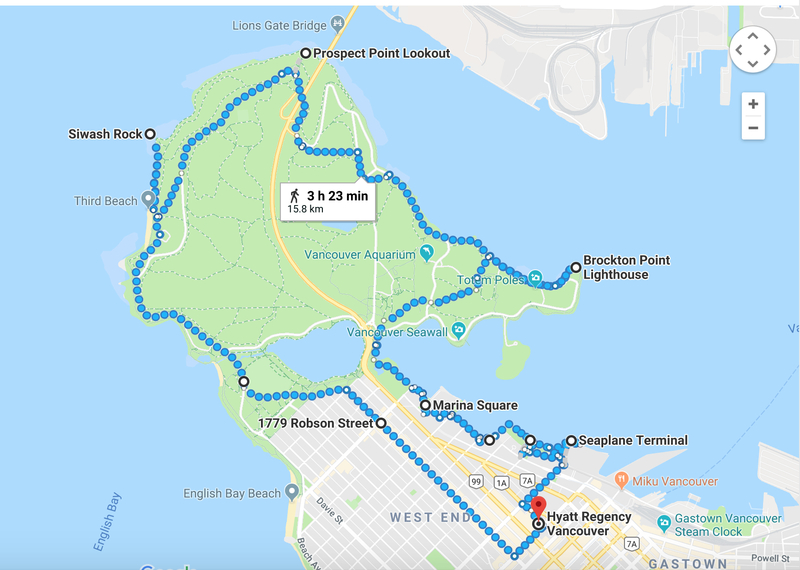 My Seawall Loop walk starts from the Hyatt Regency because that’s where I always stay when I visit Vancouver, but alas, it is a loop, so one could jump in at any of the below points. I’ve done this walk in all kinds of weather but as you’ll see in the photos, luck was on my side for this Vancouver visit because the weather was amazing. Beautiful foliage everywhere. Beautiful colors to begin our walk! Starting from the Hyatt, you’ll exit onto Burrard Street and head north towards the water. As you walk four blocks to the water, you’ll pass a historic and architecturally beautiful building, the Marine Building. The art deco details are worth seeing so make sure to go into the lobby of the building and look around. Take the elevator up a few floors and when you get out, you’ll have an overhead view of the lobby. Beautiful! On the ground floor of this building, you will find one of my favorite JJ Bean coffee locations. It has seating on the second floor if you want to relax, read, talk, and stay a while. At the end of Burrard, you’ll cross the street to the waterfront. The Vancouver Convention Centre will be on your left. You’ll see a walkway along the water. Head left here and follow it along the water. View across the water to North Vancouver. You’ll notice that Vancouver is a very active seaplane location. Many people commute by seaplane or go to Victoria for visits. 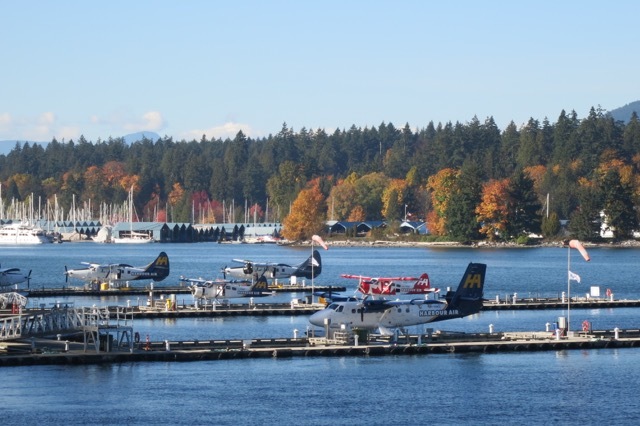 There are many seaplane destinations and it’s a great splurge just to take a tour of the area by seaplane. I did that once with a friend for his birthday and it’s really fun! Also along this part of the walk, there are benches for sitting and taking in the views of the water, parks, and mountains. You’ll also notice history information plaques all along the walk with Vancouver, British Columbia, and Canada history stories. It’s easy to miss all these because you’ll likely be focused on all the natural beauty and watching the seaplanes land and take off! You’ll notice the big condo buildings along the water. One thing I like is that even though there’s housing and tall buildings, there’s also lots of grass. Seems like great urban planning and multi-use thinking went into developing this area. Speaking of multi-use along your walk, be aware that though I usually see more walkers than bicyclists along this walk, there are designated areas for bicycling. There are specific and easy-to-see signs for where the walkers go and where bicyclists ride, so just pay attention. The next area you’ll come to is called Coal Harbour. You’ll see the Westin Hotel here, too. There are boats at docks and some large condo buildings and now you’re one mile from the Hyatt. 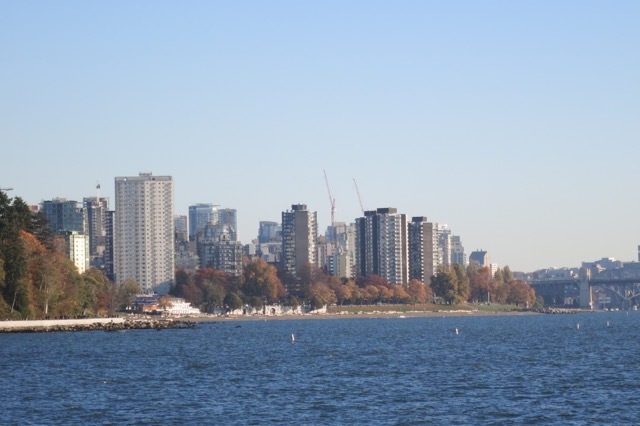 Stanley Park is so close across the water you’ll feel like you can touch it! 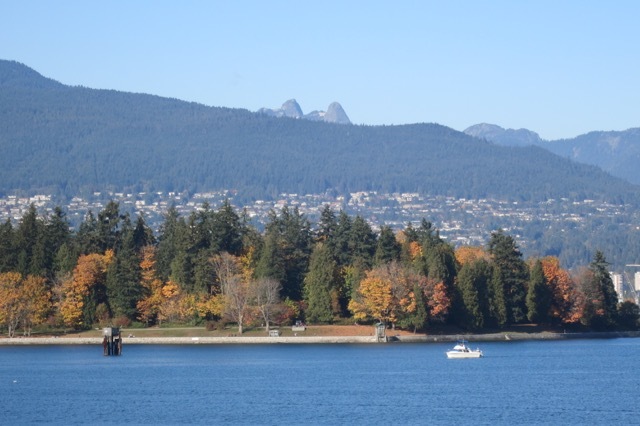 View of Stanley Park from Coal Harbour. Keep following the path along the water and you’ll come to the Denman Street cutoff. Don’t follow Denman Street because we’ll be coming back to the Hyatt on Denman. Rather, head towards Stanley Park and into the park. You’re now two miles from the Hyatt and have walked for about 45 minutes. Seawall Loop in Stanley Park. 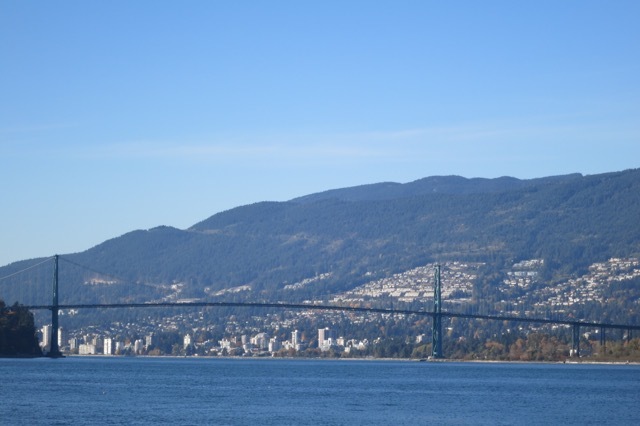 For me, the beauty of Stanley Park is best experienced by taking the seawall outer loop of the park. It does add mileage, but if you’re up for it, go for it. You certainly won’t be bored because the natural beauty in the park, plus the views you’ll have of the mountains, are truly mother nature at her best. For me it’s the perfect walk! As you loop around, you’ll catch your first glimpse of the ocean, and at midpoint you’ll see Lions Gate Bridge. It opened in 1938 and is quite a spectacular site. You’ve now walked 3.5 miles! Lions Gate Bridge. No snow in those mountains……..yet. When I book award tickets for my vacations, I always leave that part of the planning to Juicy Miles! I would never call this the best walking tour in Vancouver if it didn’t include information about bathrooms and a visitor center! So, if you’re wondering about bathrooms or a visitor center, you’ll see them from both sides of the loop in the park. They are well marked and a good place to stop for a breather. At the visitor center, there’s also an exhibit of totem poles. It’s a popular stop for people taking photos. As you continue towards the bridge, you’ll see the aquarium and children’s park. I’ve never stopped to go to the aquarium so I have no idea how it compares to other aquariums. As you walk under the bridge, you’ll have a wide open view to the ocean and you’ll notice the coast and area along the seawall become very rocky. Siwash Rock is a popular place to stop for photos. There’s a plaque explaining its significance and history. Siwash Rock in Stanley Park. As you wind around this part of the seawall, you’ll come to a beach. It’s called Third Beach. It’s a great spot to catch the sunset. I’ve been to Third Beach at many different times of the year and no matter the weather, Vancouverites enjoy this beach. And you’ve just walked seven miles! Third Beach in Stanley Park. After passing Third Beach, you’ll start to see the city. After miles of walking in what likely felt like the country, you’ll spot civilization and English Bay. You’ll walk past an outdoor swimming pool and another big kids park. 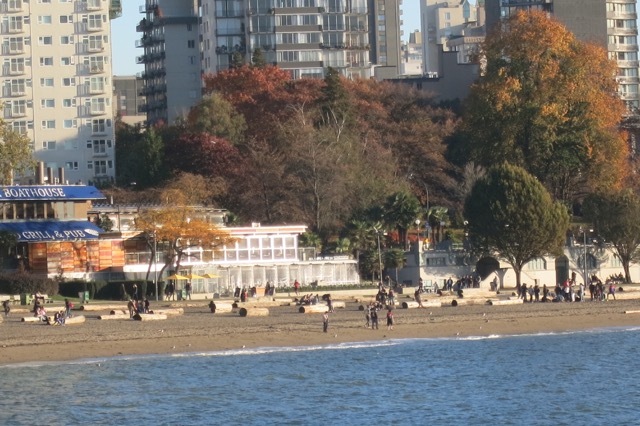 The grassy area around this part of English Bay is heavily used for picnics and just hanging out. You’re at the tip of what’s called the West End of Vancouver. It’s one of the hip and trendy neighborhoods of the city. Even with several feet of snow on the ground, as I’ve experienced during winters in Vancouver, this area of English Bay is a destination in itself and well worth the walk. View of English Bay from Stanley Park. At this point you’ll have two choices as to which direction to use as you head back towards the Hyatt. Keep in mind you’ve walked over 7 miles already. Usually, I choose to go back towards the Hyatt by walking up Denman and then making a right on Robson. Robson is full of eateries and stores and is a lively street no matter the time of day. Your other choice would be to continue along English Bay toward the Burrard Bridge. Then you’d take Burrard north to the hotel. This way is longer, for sure, so it depends on your energy and time of day. If you take the first route up Denman and Robson, the WHOLE loop is nine miles! Congratulations! You’ve just completed one of my favorite walks in the world! I sincerely hope this seawall walking loop is something you’ll enjoy. I truly believe it’s the best walking tour in Vancouver! Walk parts of it, walk all of it, but just get out in Vancouver and walk. It’s the best way to see the city! Stay tuned for another great walking loop around Vancouver! The infamous malfunctioning Olympic torch is permanently stationed at Jack Poole Plaza at the immediate west of Convention Centre West. The West End of Robson/Denman is a great neighbourhood for authentic Asian ethnic eats. Those restaurants cater to homesick exchange students. Good reminder about the torch. My favorite eatery at the end of Robson/Denman is Baoguette Vietnamese. I never miss a chance to eat there. Thanks for reading and adding your expertise!